Quantity Pricing:Discount for 2 or More! Both my African grey and my cockatiel have been on Harrison's pellets as long as they have been with me. 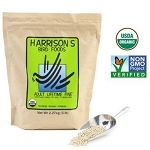 This brand was originally recommended to me by my avian vet, and my birds have thrived on it. When Billy, an Amazon Yellownape was diagnosed with fatty liver that would drastically affect her life, her vet recommended she be fed Harrison Adult Lifetime Coarse pellets. Since she has been on this diet, her liver is within normal range. She is still allowed to have a bite of table food when I eat, but 80% of her diet is pellet food. Sure has saved me from eating in a closet or my ears having to put up with her yelling at me "for some". 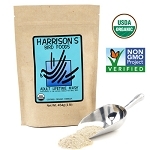 The bag of Harrison Adult Lifetime Coarse always is fresh and has a long shelf life. My birds have eaten Harrison's for years and eat it happily. 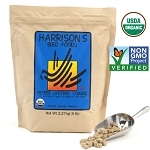 We have had very positive comments about these pellets from several avian vets. I have a male eclectus. 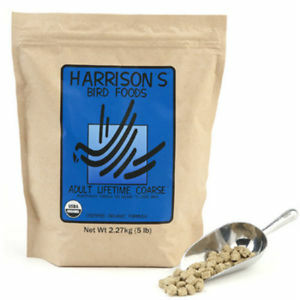 My avian vet recommended Harrison’s. I was supplementing with tops organic adult care. However my little boy isn’t very excited about the harrisons. I placed it in a bag and smashed it up slightly. He seems to be doing a little better with it. Next time I won’t order the coarse I’ll try one of the others. On the flip side I placed my order and received it within 3 days. I will continue to order Harrison’s. Thank you for such fast delivery. Q: What's the expiration date for this product? A: This is a very common question and since the answer will change with time, feel free to contact us through the the Contact Us Page or email me directly. 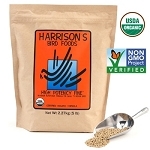 Since the Birdsafe Store sells more Harrisons than any other online store, you can always be assured of good expiration dates way beyond the 4-6 week period you should use the pellets up by. 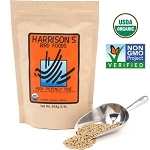 Generally expiration dates for most Harrisons items are 10-12 months out. Q: will this food work for my Senegal 8 years old and my Amazon 23 years old? The Amazon is now starting to really like the food, the Senegal doesn't seem to yet. A: Yes, this would be appropriate for both a Senegal and Amazon. 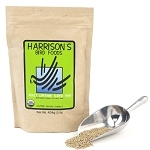 You may want to start birds on High Potency for 6 months and then switch to the Adult Coarse once they are eating it.